I think every studio in Canada has a copy of this floating around somewhere. It’s one of those pieces of artwork that’s become part of our folklore. I picked up a copy about 15 years ago at Dynomight Cartoons in Ottawa, and still have it tucked away in a box somewhere next to random doodles and hand-drawn birthday cards from Mik Casey, Nick Cross, Troy Little, and Tavis Silbernagel. 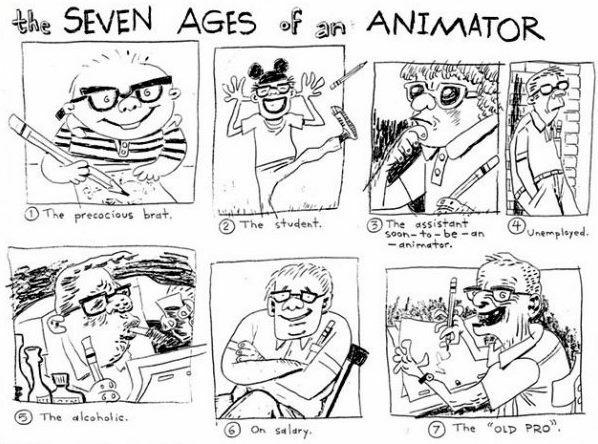 The Seven Ages of an Animator is by Graham Falk, who himself is something of a mythical being. Graham is probably best known for creating Untalkative Bunny, a cult kids’ show that aired in the late nineties on Teletoon. Thanks to John Flagg for sharing this on Facebook. This entry was posted on Wednesday, April 17th, 2013 at 11:14 am	and is filed under comix. You can follow any responses to this entry through the RSS 2.0 feed.